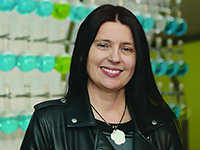 Dr. Jelena Janjic will speak about her work using nanotechnology to develop medicines to treat chronic pain at the TEDxCMU Conference Saturday, March 30. Janjic, who created the first inflammatory pain nanomedicine that could significantly reduce the need for opioids, will present When in Pain, Innovate! at 2:20 p.m. at the Cohon University Center at Carnegie Mellon University. Janjic is the founder and co-director of Duquesne's Chronic Pain Research Consortium and an Oak Ridge Institute for Science and Education (ORISE) faculty fellow/principal scientist for the 59th Medical Wing of the U.S. Air Force. She received a 2018 Pittsburgh Business Times Innovator Award. TEDxCMU is a day-long conference that brings together innovative speakers from around the world to discuss their work. TEDx allows local community groups, such as schools and businesses, to organize, design and host their own independent event using the annual Technology, Entertainment, Design (TED) conference model.